Order in the next 3 hours, 19 minutes an 11 seconds for same day shipping. The impression of the 46025 is circular with a maximum of 25 mm diameter. It allows up to 5 lines of text. Practical idea: use it as entrance stamp for museums, night clubs or for printing customer loyalty cards. 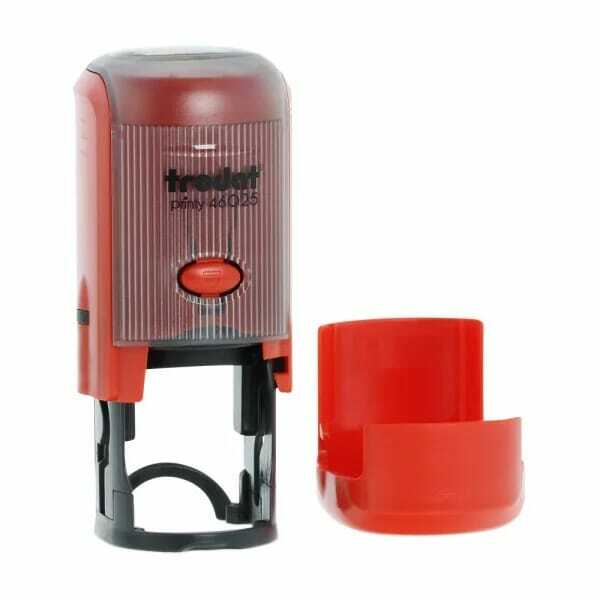 The Printy 46025 has been ergonomically designed to be able to be used with a minimum of fuss with a single hand. It is equipped with an ejection button for replacing the ink cartridge 6/46025, which is available in 5 different colours: black, blue, red, green and violet. Dry felt pads are suitable for special inks. Customer evaluation for "Trodat Printy 46025 25 mm diam. - 5 lines"